Just in time for berries, cherries and all the beautiful stone fruits, Noosa has come out with a new lemon yogurt that does double time—it’s perfect for breakfast, of course, but it can also turn seasonal fruit into a dessert parfait in seconds. 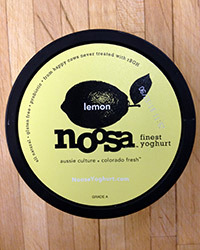 The yogurt is super-luscious and satiny-smooth, yet light on the tongue, and the lemony flavor is pucker-perfect. All it needs is a good stir once you lift the lid and it’s ready to go. The company, founded in Australia (hence the “h” in the spelling) but now Boulder, Colorado-based, makes all of its yogurt from milk from local, pasture-raised cows.